How to master the art of training trees into different shapes such as tables, chairs and even people. Trees are brilliant show-stoppers in a garden, be it by virtue of a great single specimen or a tree trained into an extraordinary shape. 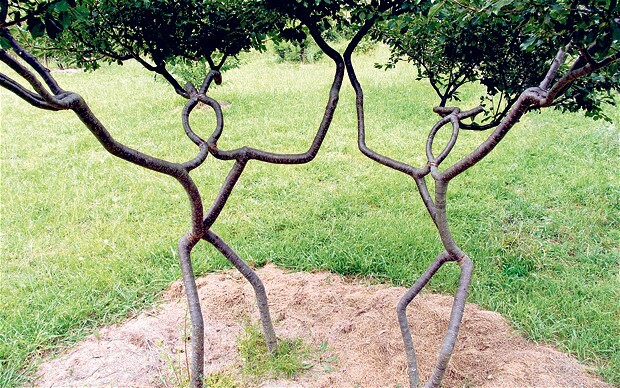 Peter Cook and Becky Northey have spent the past 25 years mastering the art of shaping growing trees into people, chairs, tables, mirrors and other intricate shapes. The initial idea came in 1986 when Peter, walking through his 162 acres of old wood and admiring the treesâ€™ weird shapes, decided to try to grow a chair. Pooktre, in Warwick in the Australian state of Queensland (www.pooktre.com), was then started and Peter and Becky have been experimenting with different forms and species since. They grow bespoke pieces in their nursery for clients which, when complete, can be transplanted to their garden. Alternatively they can be cut and dried for use as chairs or mirror frames. The main tree types they use are the myrobalan or cherry plum (Prunus cerasifera and Prunus serotina). Instead of training the trees using the â€œpleachingâ€ method (cutting existing growth and then shaping the new shoots), they start their shapes by planting tiny transplants â€“ 30cm high â€“ and growing them around a wire frame that correlates to the eventual shape. To create a person, two mini plants (for each leg) will be planted, and the new growth will follow the wire. When two shoots meet (where the tops of the legs form), then two matchstick thicknesses of shoot will be joined together using a simple graft which bonds in a matter of days as the growth is so young. Once the required shape has been achieved, the tree is allowed to grow on above it and develop into pretty much its natural form. For a 2m â€œpersonâ€, the tree height may be 6m or 7m. Peter and Beckyâ€™s tree people take around seven or eight years to mature, but, Becky points out, it is dry in Queensland and they do not irrigate. This may look amazing but may be too ambitious for most of us. There are many simpler alternatives. A friend of mine, Bill Cockerill, has been pruning and shaping trees all his life commercially (working for Coles Nurseries as a senior craftsman) and as a hobby. Billâ€™s shapes are more straightforward than the elaborate chairs and mirrors at Pooktre. I saw a beautiful myrtle arbour at Hestercombe many years ago and have copied the principle using different trees (often hornbeam) and gleaning Billâ€™s advice. Hornbeam is an easy, tolerant, clippable and fast-growing plant. Normally a metal worker makes up a light frame from thin metal bars. The metal work describes the usual â€œCâ€ shape on plan with nine or so horizontal curves spaced to give a height you can walk into. Three or four vertical bars support them and the opening front can describe any style of arch you want, such as elliptical or gothic. The young trees are planted around the outside of the metal frame and tied onto it to give the required curvaceous form. I usually plant 90cm-high bare-rooted whips. You can train the side branches horizontally initially and eventually you will have the metal framework clothed in clipped green foliage that is maintained as a hedge. I am embarking on making one from box with a ball finial at the very top. This will take a few years, but wonâ€™t require much work at any one time, and when it is finished I hope it will be quite something. Arbours formed from growing willow are much faster, and willow sculptors such as Clare Wilks (www.clarewilks.co.uk) have done many fabulous examples. They take lots of clipping â€“ maybe five times a year â€“ to keep them trim, but the branches will eventually graft together to form curious and attractive knobbles. Simple arches from two trees pulled over and tied at the top are fantastic â€“ they will graft together eventually. You could plant a series of pairs of apples (or pears) like this along a central vegetable garden path. To create this I would get two parallel metal arches and put them a metre or so apart, with horizontal metal bars connecting them at around 300mm spacings. Planting an apple (a young bare-rooted maiden two years old or so) with a rootstock such as M106 either side would allow you to bend the tree, as the wood would not have hardened up too much. You could then take side shoots out to follow along your horizontal bars to form a curved espalier for your path. Growing hedge houses can be successful too. Plant the outline of the house (be it rectangular or circular) with a hedging plant such as yew, holly or hornbeam. Leave a gap for the entrance. Train the roof in a dome or pitch using a metal or cane framework. Clip out the inside to maintain the space, then clip out the windows to suit. This might not mature in time for your young children to use, but a house of sorts could be formed in 12 years or so. If you lack patience, build a trellis house for the framework, so at least you have an instant structure as well as, hopefully, the long-term satisfaction.